There it was. The thought that popped into my head mid-way through the second period. It wasn't following a bad goal. It didn't happen after taking a puck to the knee or head. I was watching my defenseman skate the puck out of our zone and it just entered my head. Maybe its time to stop. We are four games into the Puck Hawgs summer season and we have been doing well. 3 wins and 1 loss. Just 3 losses to 21 wins since we moved to the Upper 'B' division. But I've been struggling this season. My GAA has shot up and my save percentage has dropped below .900 for the first time in a while. This season the Hawgs aren't dominating but instead games are closer because I'm letting more pucks by me and more shots that beat me are because of my mistakes. My skills are improving at a snail's pace. I recall when I first started playing again that each lesson opened up the potential for tremendous improvement. New stance, butterfly drops, butterfly pushes, C-cuts, they all took time to master but the improvement in my game was measurable and the results followed. For the past year or so, the only addition to my game has been the RVH and while I now use it in games, the improvement I want to see in that is painfully slow. I am getting slower. I've been capturing a lot of video from my games and have been reviewing each with a critical eye. I've also compared them to some video captured two years ago and it is hard to dispute that my movements around the crease have slowed. 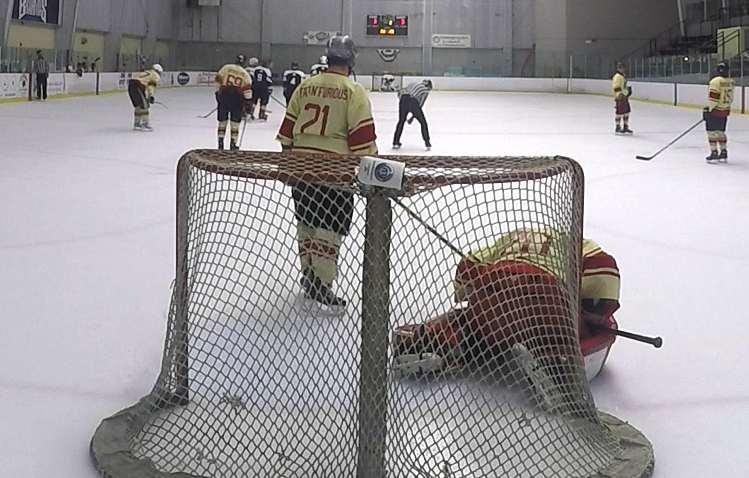 I'm not getting up from the butterfly as quickly and where once I seemed to scramble my way to rebound saves, now I seem helpless to react to those plays that demand throwing your body and legs around the ice to make a desperation play. I'm playing in survival mode. I just can't deny it. Games where the puck is my zone a lot or I see 30+ shots I am struggling to retain my technique. I'm often winded and I am in energy conservation mode earlier and earlier in games. I watch the video and see whatever speed and power I have in the third period of games is lacking compared to the first. Solutions? Get stronger and get fitter. Practice more and play less. Don't be 50. Some of these may be easier to accomplish than others. I had a recent conversation with my of my best friends on the team and let him know how I was feeling. I told him I thought maybe I was slipping into the category of goalie I never want to be... the goalie who gets eye-rolling reactions to letting in softies. The one who makes the team feel like they need to light up the scoreboard just to have a chance at a win. He reminded me of our win/loss record and that playing in this division means I see shots from players who boast a Jr. hockey or college career. I think I'm afraid of letting my guys down- the nature of a goalie. He told me I'm not. I'm still having fun. I still look forward to every game with anticipation. I still get butterflies on game day and even though every game is a physical struggle I want to keep playing. Maybe I can commit to one more fitness rally and squeeze out a couple of more years. I know I want to. 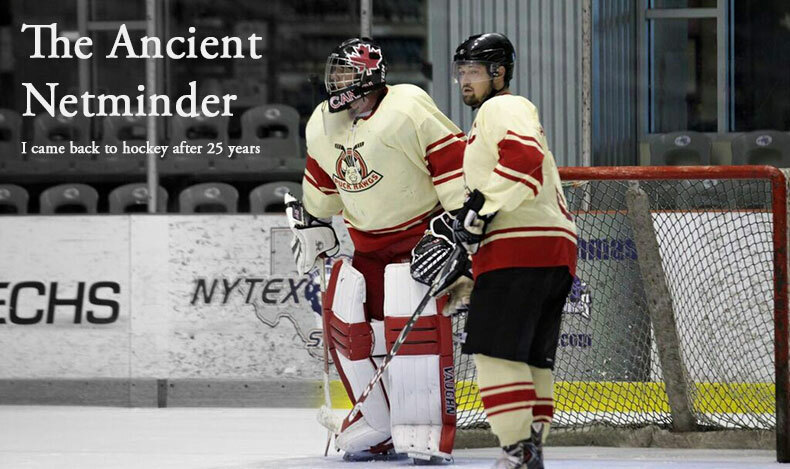 I also know that there is life beyond 50 for goalies but in my case it might not be at the level I'm playing. I'm hoping for a rally.